Let’s face it, my gluten-free friends. When it comes to pizza crust, we usually have two options – make it ourselves…or use the frozen pre-packaged cracker crust pizza shells made by numerous gluten-free companies. While these aren’t all bad…I have been fortunate enough to go to a few restaurants that actually make gluten-free pizza crust that isn’t crunchy thin and tastes like…real…awesome…pizza…crust. But, tradition for me is a gluten-free pizza before the night of a big race. For 5Ks…I’m apathetic on the tradition, but on a 10K or higher…you better believe I want my gluten-free pizza the night before. I’m a superstitious athlete…and this has just been my magic night-before-the-race fuel. It just works for me. But…recently I’m on a tighter-than-usual budget (I blame race fees! ), so instead of dropping money at a restaurant, I decided to pull out this kit I purchased at my local Earth Fare awhile back and give it a shot. It would be…the best of both worlds. A crust made from a mix that I got to roll out like a real pizza…without it feeling or, hopefully tasting, like those gluten-free cracker crusts of gluten-free pizza monotony. It had been a long day at work and I was rather hungry when I walked inside from a long day at the office. Immediately I settled into the kitchen to get this pizza working. I opened up the kit, pulled out the vacuum-sealed pizza crust mix, the sauce packet, and the baking paper that they provided. I preheated the oven to 450 degrees and put my pizza stone in there to warm up. So far…so good. Now came the fun part. I call this the fun part because this is where I felt like I was really, truly, making a real…yes a REAL pizza. The crust was vegan, which means it had no eggs added to it and no dairy was involved in making it. In fact…it took 1/2 cup of water, warmed in the microwave for about 30 seconds, then the pizza crust mix that was provided. This was a simple blend of organic brown rice flour, organic buckwheat flour, teff flour, sweet rice flour, yeast, organic raw sugar, sea salt and vitamin C. Seems legit, yes? Well, I did as instructed and poured the mix into the warmed water, stirring it until it was all incorporated and then making a dough ball, as instructed, in the bowl, covering it with the provided baking paper, and letting it sit for 10 minutes to rise. While that was happening, I prepared the rest of the toppings…which is whatever you want. 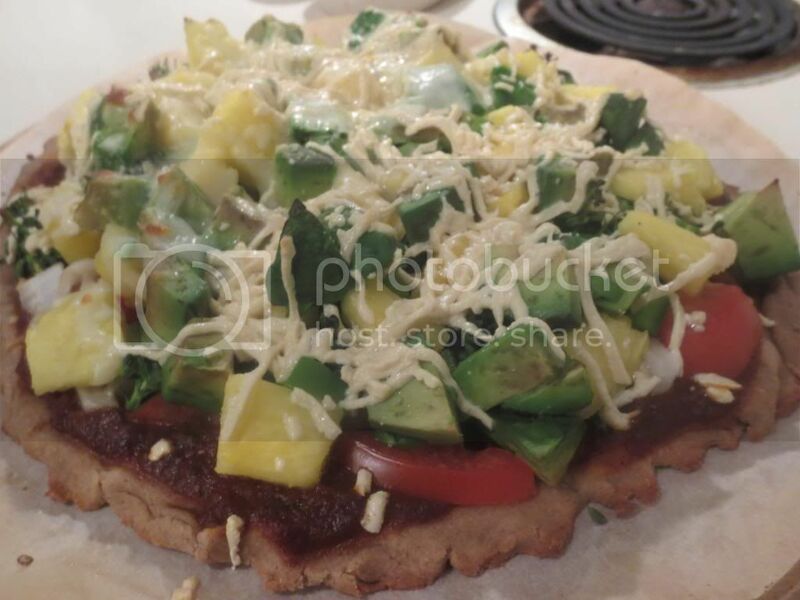 For me…vegan Daiya cheese, avocado, pinapple, tomato, onion, green pepper, and broccolette. Mmmm…veggie pizza with a hit of sweet pineapple. It would be epic. I just knew it. Well, I ran with it. The baking paper was placed on the counter and I put two teaspoons of olive oil on it. The dough ball was plopped onto the paper and rolled around into the olive oil, then I grabbed my rolling pin and rolled it out into a 12-inch circle as best I could, doing a horrible job at crimping the edges. No surprise. This isn’t my forte. Anyway, I slid the baking paper with my crust base over to the warm pizza stone and set it on the low rack to begin cooking for about 10 minutes. When that 10 minutes was up, I pulled it out and did as I was instructed by the kit…I poured the sauce packet on top and spread it out to coat the crust. The sauce, by the way is a simple blend of organic whole peeled tomatoes, organic tomato paste, organic extra virgin olive oil, organic garlic, organic raw sugar, organic basil, organic oregano and more organic spices. It sounded organically awesome, honestly. Pure, natural ingredients. I like it. Then, over the sauce I added all the toppings and a scattering of my Daiya mozzarella shreds. Vegan pizza…is awesome. Trust me. And back into the oven it went for another 10 minute baking session, allowing the crust to cook more, the toppings to warm, the cheese to melt, and that pineapple to caramelize. When 10 minutes was up…the pizza stone came out and my pizza was done and ready to eat. All of this is around 30 minutes time. Not too bad for a dough you prep by hand. That was, actually, my favorite part of this process. I felt like I was eating something real. Not just a frozen mass of dough already pre-made for my convenience. I like getting my hands into things and making and rolling the dough was a nice step in that direction. So…here it is…the truth, the whole truth…and nothing but the truth. GalloLea Gluten-Free Pizza Kit let me down. It just…let me down hard. I went to slice through the crust and found that it was…very difficult to slice into. My hopes of having this beautifully crisp yet soft pizza crust flew immediately out the window. I was already frustrated with the crust and I hadn’t even tasted it. Once I managed to slice it into fourths and then into smaller pieces for consumption purposes, I took a serving (1/4 of the pizza) to my roommate and served up another serving for myself. I settled in, hoping the taste would make up for the tough to slice through crust. Nope. This crust turned out to be completely tasteless. It was crunchy and bland…reminding me more of the cardboard flavored gluten-free products of yesterday rather than the amazing flavor, texture, and taste that can come with gluten-free products that are done right. SO frustrating and aggravating. I was let down. The underside of the pizza crust got this amazing crunch to it, but the top, the part that was sauced, turned into a soggy mess. I’m sorry…pizza crust should not be soggy. Ever. It was lackluster, uninspired, bland, and just plain…disgusting. I almost didn’t want to save the other half of the pizza for the following evening. But I did…because I didn’t want to waste money. Ugh. I reheated it the following night in a skillet, hoping it might improve the crust some. Nope. Still a bland, soggy mess of a pizza. GalloLea…you did everything wrong with this mix. I mean, who says that pizza crust has to be bland and just…not worth the effort to make it. I was so disappointed with the time I spent rolling out this dough and preparing it. The sauce was bitter and didn’t taste good at all. I’d recommend using your own sauce if you happen to have one of these in your pantry. I’m just saying. As for the nutritional worth of this bland pizza crust…with the sauce included…the serving of 1/4 of a pizza will set you back 170 calories, and that’s without counting the toppings you add to it. There is only 1 gram of fat in the mix and sauce, however, and it does provide 3 grams of fiber and 6 grams of protein. This mix is also low on sodium (220 mg) and contains only 3 grams of sugar. It is cholesterol free as well. Unfortunately…it is also disgusting. And I was so disappointed that once again I was stuck with a less-than-satisfying pre-race pizza. I want a good pizza before a race, dammit. Is that too much to ask? My recommendation…make your own gluten-free crust. Don’t rely on mixes. And if you are pressed for time, there are plenty of tasty, frozen, pre-made gluten-free pizza crusts out there to throw into the oven with your own sauce and toppings. 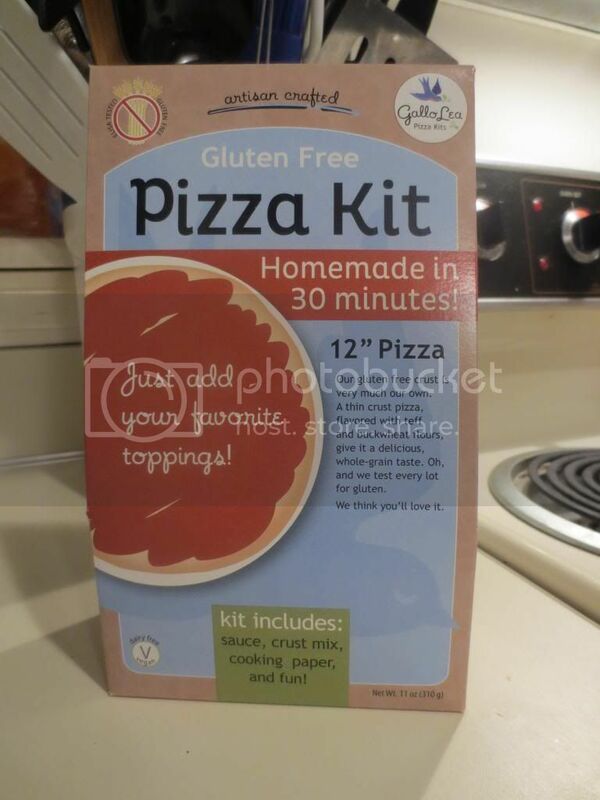 Don’t waste your time and money on the GalloLea Gluten-Free Pizza Kit. You will regret it. I sure did. GalloLea Pizza Crust stopped with my amazing toppings. The toppings were the best part. The crust was horrible! 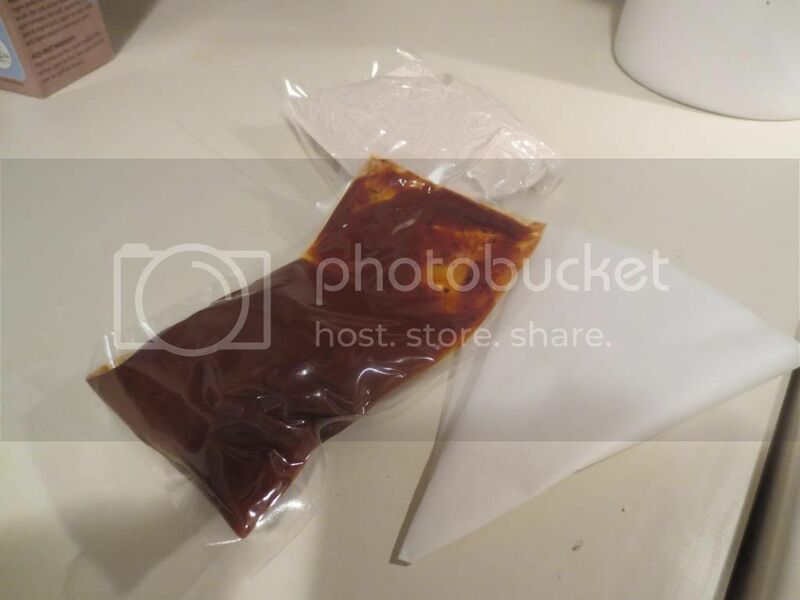 This entry was posted in Baked Goods, Cheese, Entree, Food, Gluten-Free, Italian, Mix, Pizza, Products, Review, Sauce, Vegan, Vegetables, Vegetarian by The Celiathlete. Bookmark the permalink. Wow! I had such a different experience. I made this crust (spread by hand, not rolled), doctored the sauce with added onions and fresh basil and added cashew “cheese” (have the recipe if you want). I didn’t do the pre cook just added the sauce and “cheese” and after cooking garnished with sliced tomatoes and avocado. The crust was crisp, delicious and crunchy and a great blend of flavors. I have made this many times and served to guests and will continue to do so. So sorry you had an inferior experience.